One a much lighter note than anything else I've written lately, last week Patrick and James were watching PBS Kids at Nani and Bopa's house and they saw an advertisement for MSU's Great Dairy Adventure. 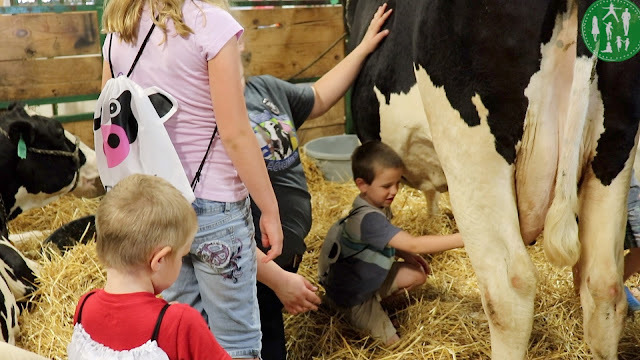 The Dairy Adventure is basically a huge dairy event (meaning lots of cows and activities for kids) on campus at MSU, and Patch, especially became immediately obsessed. He wanted to go. He wanted to milk a cow. It was pretty much all that he could talk about. And if you only know one thing about Patrick know this: he talks a lot. In fact it would not be inaccurate to say that during his waking hours, he talks non-stop. So we went. And we stood in an enormous line. And it was totally worth it for this moment when Patrick got to milk a cow. But there was way more to the day than just milking a cow and I threw some of the highlights together in a fun little video of our day. And of course, milking the cow is there too. I can't wait to show Patrick when he wakes up!